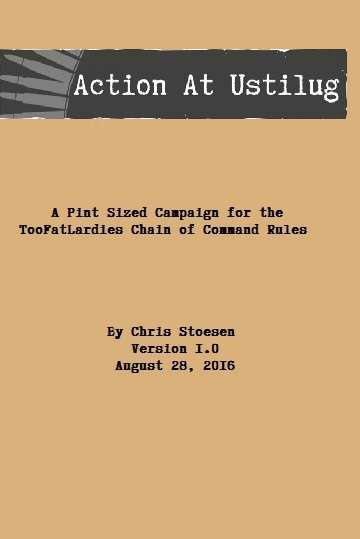 The Action At Ustilug is a pint sized campaign for Chain of Command. It contains a half ladder campaign with a variable support system that adds an extra level of friction to your support choices. The campaign covers the opening day of Operation Barbarossa. The German 289th Infantry Division crossed the Ukrainian border at the bridges near Ustilug and encountered the Soviet 87th Rifle Division and elements of the 41st Tank Division. The scenarios cover rural as well as urban engagements. The Soviet defenders acquitted themselves well and delayed the German advance through the town at every opportunity. The booklet weighs in at 22 pages with full maps for each scenario. This does not have the same production quality as the Pint Sized Campaigns published through TooFatLardies as it has no graphics other than game maps. This is the first early war Eastern Front Supplement designed for Chain of Command to be released.